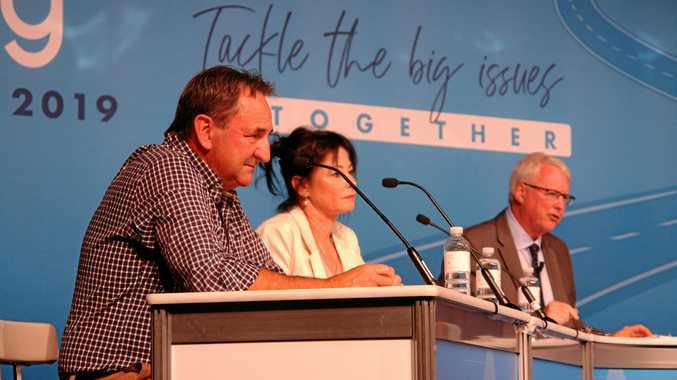 GRASSROOTS trucking advocate Sharon Middleton sent a clear message at TA2019 to those unhappy with the current trucking laws - now is the time to have your say. The director of Adelaide-based Whiteline Transport and one of five industry panellists charged with guiding a "clean sheet” review of the Heavy Vehicle National Law didn't mince words with delegates in Perth earlier this month. "It's up to all the people in this room [to help effect changes],” said Ms Middleton, who is just as comfortable behind the wheel of a road train as she is taking centre stage at an industry summit. "Okay, I might be on this panel but it's up to everyone in this room as these submissions come out to get their comments in so that when I go to meetings I can actually give my perspective as an operator as to what kind of impact they [suggestions] might have to all of us on the road,” Ms Middleton said. "If you don't feel that you're able to articulate yourself to put in a a submission, contact one of your member state organisations to do that on your behalf. "But you've got this amazing opportunity here at the moment, don't let it go. Ms Middleton was joined on the stage in the Fixing the Truck Laws session by Paul Davies, the chief planning officer at the National Transport Commission (NTC), and the man charged with overseeing the HVNL review. Mr Davies said there is now a new HVNL microsite - hvnlreview.ntc.gov.au - dedicated to the review. It is now the industry's primary resource for review updates, information from the expert panel and having your say. There, you'll also now find a discussion paper, A risk-based approach to regulating heavy vehicles, the first of eight to be published between now and August, Mr Davies said. A risk-based approach to regulation centres on the principle that regulation should target the most significant risks to safety. "What we want to do is recognise that if you're operator in remote areas, it's just a different thing,” he told TA2019 delegates. The NTC is accepting first submissions up until May 31.